After writing in a recent issue of The Priest magazine about how living a life of joy and hope can help priests face obstacles in their lives, a great challenge has arisen — again — in the life of the Church. In light of the Pennsylvania grand jury report and the questions swirling around Archbishop Theodore McCarrick, the lives of priests have been affected greatly by these ongoing scandals. Still, despite this dark time in the Church, we priests still need to be full of Christ’s light and live joyfully — for God, for our flocks and for ourselves. In our secular world, the reward of a life to come after death has largely been forgotten. But without a firm conviction about our ultimate destiny, any hope or joy that comes our way in this world will be temporary. No matter how much a faithful priest endures in the present situation or what he is asked to do, he does well to remember that we are made for more than this world. While our present lives and ministry are important, we are made for eternity. With this in mind, we reflect on six considerations. The Holy Spirit is at the core of who we are as priests and guides the Church in the way of truth. The present crisis in the Church is not the first one in history, nor will it be the last. In times like this, it’s important to realize that the Holy Spirit is working to bring good out of evil. It’s too early to anticipate what this might mean for the Church’s future. But for the priest it reminds us to renew our faith in God’s abiding presence and to encourage others to do the same. Many priests are frustrated, disillusioned and hurt at what has happened and what is going on now. This is a heavy burden. In this climate, faithful priests need to remember that they can only do so much. While some things may appear to be falling apart externally, priests are challenged to live a hope-filled and joyful life. Why should faithful priests live in any other way? It is their faithful day-to-day presence and ministry that inspires others and motivates them to remain in the Church and serve God’s people. Although a priest individually may be powerless to effect institutional/systemic change in the priest scandal, he needs to pray that the Holy Spirit will bring wisdom to Church leaders. As to himself, his demeanor and openness are the kind of witness that ordinary people need to see in troubling times. In his ministry, a priest’s joy brings renewed trust to a community that has many questions and may not know who to believe. Priests who reflect the joy of Christ — and the joy of the early martyrs as they offered themselves for their faith — are a great blessing and attract young and old alike. A joyful priest is needed more today than ever. What we do as priests is important. It is rooted in who we are as children of God and in our being Christ to others. I came to a deeper awareness of this connection during a prolonged sickness years ago. Being limited in the work commitments I could do as a priest led me to reflect on my identity as a person. I realized that my work as a priest and who I am as a person go hand in hand. What I do is rooted in who I am. As priests, who we are and what we do shape each other; we need both/and to be the joy-filled priests we are called to be. Perhaps the greatest gift a faithful priest can offer today’s Church is to be faithful to who we are and to what we believe, all while listening to, supporting and treating parishioners kindly and with compassion. Today’s priest can rise above the fray and reflect on why we are priests in the first place. To be a priest is to accept our cross and walk the road to eternity with confidence and hope. While fully cognizant of our responsibilities in this world, the important work we do as priests — celebrating the sacraments, especially the Mass, comforting the dying, teaching, preaching and more — is rooted in our belief that we are on a pilgrim journey and do not have here a lasting place to dwell. Convinced of who we are as servants of Christ in this world, anticipating eternal blessedness in the next is the fundamental reason for our lasting joy and hope. Discerning how a priest should respond in troubled times is not easy. It serves the priest well to re-examine Jesus’ attitude toward servant leaders. Jesus came as a servant, or, as he says, “The Son of Man came not to be served but to serve, and to give his life a ransom for many” (Mt 20:28). Jesus’ servant leadership allowed him to cut through the evils of the time and to set in motion a new way of life, centered on the beatitudes. The challenges facing the Church invite every priest to examine his role as a servant leader in imitation of Christ. Such leadership will lead others to Christ. To do this calls for humility. 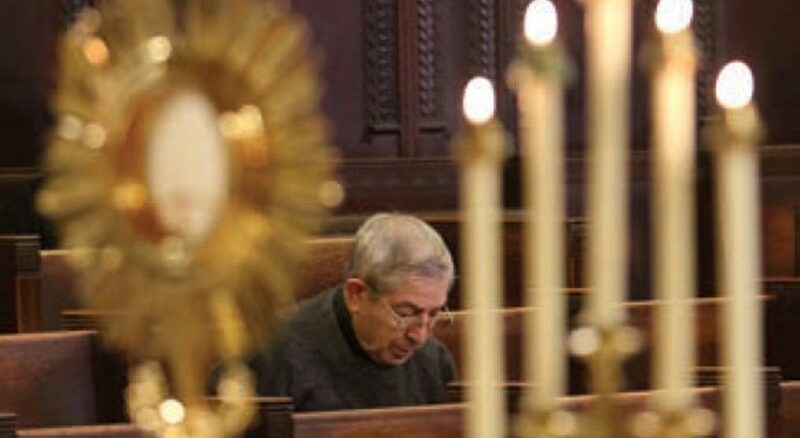 A humble priest listens attentively to others in the faith community. How he responds speaks loudly. Many apologies will be spoken by the pope, the hierarchy and the clergy. Such words are necessary, but reconciliation requires more. It requires action. In this effort, priests can play their part by serving well the faithful entrusted to their care. We are invited to recognize anew that a truly humble priest powerfully influences others, no matter in what condition the Church finds itself. The Eucharist brings the cross of Christ to our altars and into our lives. Today’s priest must carry this cross. He must do so while some people reject and ridicule him or wonder why he remains a priest. He must maintain his hope when projections are heaped on him by those who are frustrated and hurt. Amidst such reactions, the priest receives a powerful reminder from Jesus’ words: “No servant is greater than his master. If they persecuted me, they will also persecute you” (Jn 15:20). This reminder comes every time a priest celebrates the Eucharist. Then, he remembers how Jesus was rejected. The Eucharist offers a priest the opportunity to recall that resurrection happened after Jesus carried his cross, and that the joy of new life emerged from death. This memory gives us confidence that the Holy Spirit will strengthen us and eventually transform evil into good, despair into new hope and sorrow into joy. In the challenges facing priests, we do well to reaffirm joyfully our belief that we do not have here a lasting home; instead, we wait for one to come. The crisis in the Church tells us that evil exists. The faithful priest is a countersymbol, reflecting the goodness of human nature. He witnesses that living a good life is possible and that all the secular pleasures and goods of this world cannot satisfy the deepest urgings of the human heart. Such fulfillment comes only in joyful union with Christ here on earth and in eternal blessedness in heaven. As we come to grips with what is happening around us, let us approach our ministry with enthusiasm, joy and hope. May Mary, the Mother of God, who faced the ultimate tragedy of Jesus’ suffering and death with hope, inspire us. May her life of faithful service give us the strength to maintain a positive attitude toward our priestly ministries as we move forward on our priestly journeys.